It was a real pleasure to spend a week with a group of McMaster students on Manitoulin Island this May for MacServe Engage with Canadian Roots Exchange. This trip was truly the cultural learning experience of a lifetime. The theme of Canadian Roots’ program is reconciliation – bringing together Indigenous and non-Indigenous youth for dialogue, openness, understanding and togetherness. Canadian Roots works to bridge the gap between Canada’s peoples by creating opportunities to live, work and travel together to First Nations communities across Canada. Following this philosophy, the MacServe group was very diverse, coming from different backgrounds, from different areas of study and interests, different ages and life experiences. Together in M’Chigeeng First Nation community, we were immersed in First Nations culture, traditions, and teachings. We visited severalcommunities on the island and were always welcome with open arms, a cup of tea or a hot cup of coffee. We met with youth, shared meals with community leaders and were incredibly fortunate to share teachings with some very respected elders in each of the communities that we visited. For me, the most impactful and lasting impression from this MacServe experience was the real deep sense of community that I felt in Manitoulin Island among our group, and in each of the communities that we visited. 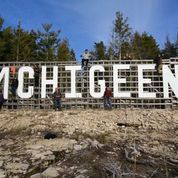 M’Chigeeng felt like home. Friends and neighbours came to visit, meet with us and share their lives and stories. This feeling of community is more than a sense of place or purpose. This sense of community is much more deep and valuable. It is about togetherness. It’s about supporting each other; knowing your neighbours, and being there for each other. Connecting with cousins, cousins’ cousins, and actively supporting the young people and elders around you. Community is a sense of tradition, knowledge and understanding your past and potential. That very real and deep feeling of belonging and connection came through in many of the teachings shared by community elders. It shone through when we visited the site of a former residential school where past students shared their experiences with us – both positive and very challenging – so that together, we could learn, experience, and understand how past experiences have impacted their families and communities so that we can build more communities of understanding and compassion. These are only some of the beautiful memories and teachings that I was fortunate to share with Canadian Roots Exchange for MacServe Engage Manitoulin Island. There are so many more that I will continue to learn and grow from as time passes. Throughout the university experience, students are offered so many learning and growth opportunities, but there is no learning experience as unique as participating in a service or cultural exchange program like MacServe. And now, by including Alumni in opportunities for service and learning exchanges, MacServe is continuing to offer learning and growth experiences for generations to share together. There is no better way to build community than by sharing and learning together, and for that, I am so grateful to be a part of the MacServe community. Thanks to all my new friends at McMaster and in Manitoulin for sharing long lasting memories and life-changing experiences.